Barry Sherman (right) from Worcester ran in his fourth Boston Marathon as a bandit in 1996. My claim to fame in Boston Marathon history is stopping for ice cream in the middle of the race. Back in 1986, the unorthodox strategy added at least 15 minutes to my time, pushing me just over the seven-hour mark when I hobbled over the finish line. I am one of thousands of unregistered runners, better known as “bandits,” who have run without a number at the back of the pack. Along with two high school buddies, I foolishly did so with no training whatsoever. We had decided to become marathoners while watching TV the Friday night before Patriots’ Day weekend. Though common sense and health insurance deductibles may argue otherwise, bandits are the inspirational embodiment of Nike’s “Just Do It” slogan. 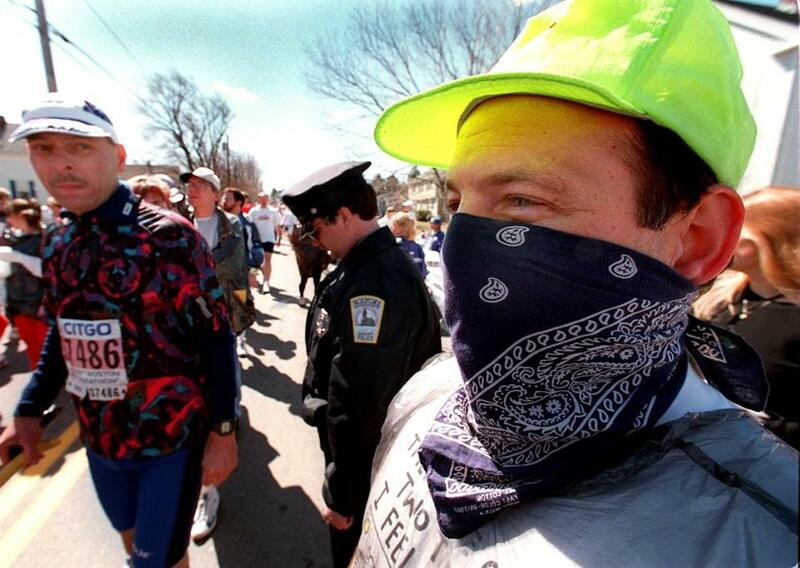 Boston Marathon race director Dave McGillivray got his start as a teenage bandit. By necessity, Katherine Switzer, the first woman to run from Hopkinton to Boston in 1967, was a bandit, too. Now they are an endangered species. Kristie Gillooly Dean ran as a bandit in 2011. “At the time I didn’t put much thought into [running.] It was on my bucket list and I decided that would be my year,” she wrote in her post on Instagram. The Globe asked readers to submit their bandit stories via social media. 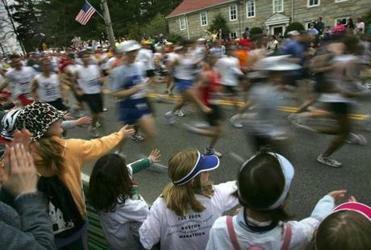 For the first time this year, the Boston Marathon is officially banning bandits. The Boston Athletic Association has forbid uncredentialed runners for years, but always looked the other way when it came to enforcement. For 2014, only runners with numbers will have access to Athletes’ Village at the starting line — an understandable precaution in the shadows of the Boylston Street bombings last year. The message of regeneration will be communicated over every step of the race. But security officials say the crackdown on party crashers has nothing to do with terrorism. Unnumbered runners in running clothes pose no threat — they have no place to hide weapons or explosives. The real reason for the ban is to guarantee breathing room for this year’s expanded field of 36,000 runners, an increase of 9,000 more than 2013. Seems legit to me, but I hope this one-year hiatus doesn’t mark the end of the Bandit Era. Strangely, there’s a core group of angry elite runners who fantasize about crushing the underdog. In an infamous diatribe, Runner’s World executive editor Mark Remy once wrote “there’s a special circle of hell reserved” for bandits. Last month, he snapped selfies while pretending to shoplift sneakers from a running store. It was a not-so-subtle metaphor for those who “steal” from marathons by jumping in the back of the race and avoid the entry fee. Reality check: Paying isn’t even an option for slower runners. There are two official ways to qualify for a marathon bib. The first is to run another marathon at a pace fast enough to qualify by time, the other to run with a charity team. Some runners just don’t find themselves in either category but want to participate anyway. 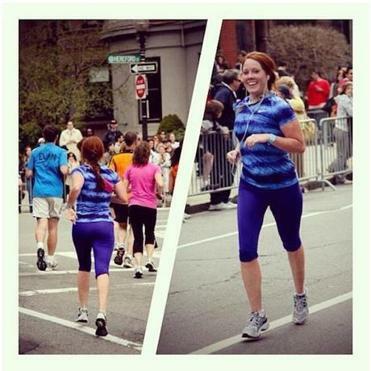 Kathryn Merrill ran the Boston Marathon without a bib in 2008. 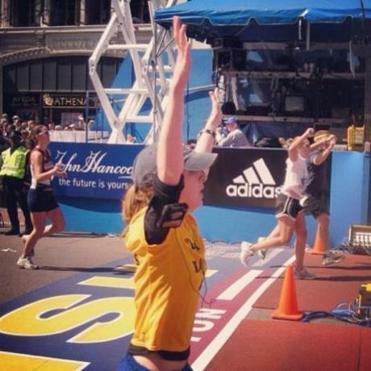 "My whole childhood, and then three years at Boston College, I watched [the Marathon] and thought I could never do it, until senior year I did,” she posted on Instagram. Curious how widely shared Remy’s views are, I recently posed the question in a Facebook running group. The response was overwhelmingly vicious: We’re thieves, we’re losers, we’re disrespectful to the runners who deserve to be there. One conspiracy theorist alleged that bandits usurp complimentary cups of water from registered runners and gobble up the official finishers’ medals for themselves. For the record, anyone who wears a medal they didn’t qualify for should be strangled with it. But it’s intellectually dishonest to suggest that we are cheapskates motivated by saving a few bucks. Kate Finnegan has completed 33 marathons since 1983 with the Red Snakes, a group of running (and walking) artists from Boston’s Kaji Aso Studio. The studio is well known for handing out ornate finisher certificates that congratulate their fellow bandits and official runners alike. Ditto for the crowds. As a marathon fan cheering on the sidelines, I’ve never seen the kid handing out orange slices recoil if the runner wasn’t wearing a number. I’ve never watched fans turn off the “Rocky” music if the runners weren’t registered. Hours after the winners take home their $150,000 prizes, bandits honor the true Boston Marathon spirit. They remind us that no amount of money will move your legs for you. Darren Garnick is a New Hampshire writer and documentary filmmaker. Read the original account of his 1986 bandit run at his Culture Schlock blog.